Accessible beach front promenade situated a stone’s throw from the crashing surf and warm sand. An outdoor space that is approximately 120’ long x 30’ wide, and can seat up to 150 guests or host 200 reception-style. If sunsets and salt air fill your sails, this is the place! An outdoor park like setting located adjacent to the Creek and in the heart of the Historic District complete with ocean views, shade and 2 private restrooms, one with a small dressing room. The area can accommodate up to 90 guests seated and 100 reception-style. Spectacular bluff top ocean view deck and includes a small attached cottage. Enjoy the sunset with the crashing waves set below, while accommodating 140 seated or 150 reception-style. The cottage features a restroom and changing room, along with an event room that is 15’ x 17’ in size. 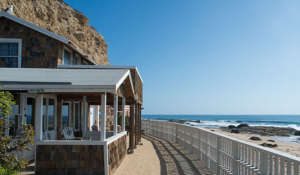 A spectacular beach connects the Historic District to the Pacific Ocean complete with clean sand, tide pools and amazing sunsets. 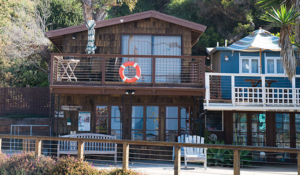 This site provides the perfect venue for a “toes in the sand” wedding ceremony or California beach party. The beach can accommodate up to 100 guests, and is available only after Labor day weekend through the start of Memorial day weekend.